Bacillus thuringiensis (Bt) is a bacterium that must be eaten by lepidopteran larvae (caterpillars) to be effective. Bt is a great material for leafroller control because it is specific and has little effect on natural enemies. However, it must be applied 2-3 times to be effective when leafroller populations are high. Experience has also shown that in the spring, the high temperatures need to be above 65°F for 3 or more days so that larvae have a chance to feed on it before sunlight breaks it down. DAS provides forecast temperatures for all stations in the "Weather Forecast" and in the "Show Data Grid" table so that you can decide whether or not to use Bt or other recommended chemicals. Mating disruption dispensers work by releasing synthetic pheromone which prevents or delays males from finding and mating with females. 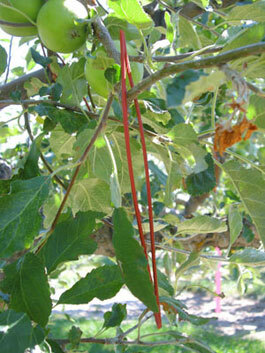 Therefore, dispensers need to be placed in your orchard before the first moths fly and mate. First moth flight (= biofix) occurs at around 175 DD. 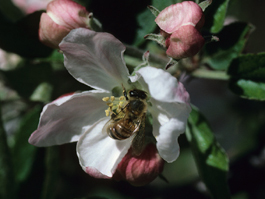 We recommend to place pheromone traps before first apple blossoms open or by 100 DD whichever comes first. 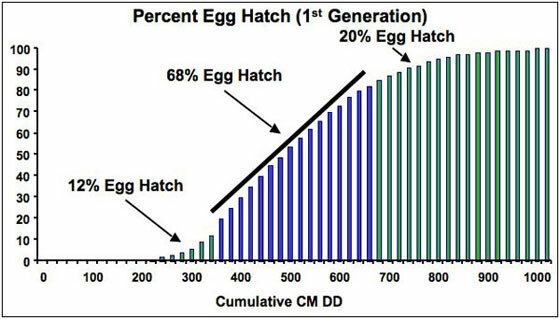 The period of time when overwintering leafroller (LR) larvae are most susceptible to the new insecticides overlaps with the beginning of the codling moth (CM) egg laying period. Some new insecticides will kill overwintering leafroller larvae as well as codling moth eggs that are laid on top of the insecticide residues. A new method of controlling codling moth has been developed at WSU where timing of the sprays is altered to take advantage of the slow start of egg laying.